For a long time now, I’ve been on the hunt for perfume sellers who offer the lowest prices. I always wanted to buy Selena Gomez (surprised? Her perfume REALLY smells good!) and Ralph Lauren Big Pony No. 2 for Women. These two almost exactly smell alike. The Selena Gomez is more fruity, and the Ralph Lauren’s a little more sensual. I was eying a couple of online sellers, but Php 2,000 for a 100ml bottle is too much for me since, you know, poverty. Then I saw ScentSwatch, an online, instagram store. They sell “inspired by” scents. They are not at all affiliated with those popular perfume brands, that’s why there’s really no promise that what you’ll get is the exact smell of your desired perfume. I thought, ‘Meh, they probably don’t sell Selena Gomez’ since it’s not a very popular scent. LO AND BEHOLD! THEY DO! Can you just imagine my surprise and delight?! I was supposed to order the night prior, but Viber was acting up. So I tried this morning, before 9am (8:58am to be perfectly exact). I got a reply a minute later (8:59am to be perfectly exact). Their 10ml bottle was out of stock, so I opted for one 60ml (Php 350) and a 30ml (Php 200). Delivery’s Php 45 for Metro Manila. Came nightfall, SS texted and confirmed the shipment of my orders, and sent me a picture of the waybill. Tada! It arrived the day after! Also, it came with a freebie! Yey! The perfumes were in a minimalist square bottles, which were carefully wrapped in bubble wraps. The freebie came in a small spray (maybe 5ml? I’m not sure). Mine was “I Love Love” (Moschino). After the first spray, i though “OMG THIS SMELLS EXACTLY LIKE THE ORIGINAL!” then after about 3 seconds or so, there’s this hint of difference, a small clue that what I was wearing was not the real deal. There’s a slight smell of something I dont associate with Selena Gomez (the perfume, not the pop star. I dont know what Miss Gomez smells like). Deal breaker? Of course not. After about some minutes, when my skin absorbed the liquid and the perfume finally settled, the base turned into that scent that I LOVE (love is an understatement). The warm, fruity scent that I oh-so adored in the original Selena Gomez perfume IS there. I literally can’t stop smelling myself. The I Love Love smelled chemical-ish at first, but I love the lightness if the base scent (a hint of orange?). But it’s a little citrus for me. It’s good for a bright sunny day, though. I’ve been wearing SS everyday since October 26 (it is now October 28), and I am impressed with its longevity. The original perfume’s longevity is topnotch. I mean, I would wear it early in the morning, and I could still smell it before my nighttime shower without the slightest hint of fading. Now, I am not expecting that kind of longevity in this ‘scent like’, but I have to say, for a less than P500 perfume, that’s really something worth to be impressed about. It stays maybe half a day on my skin, but its grip on my clothes is really amazing that I can still smell the scent, albeit a little faint, before I go home from the office. 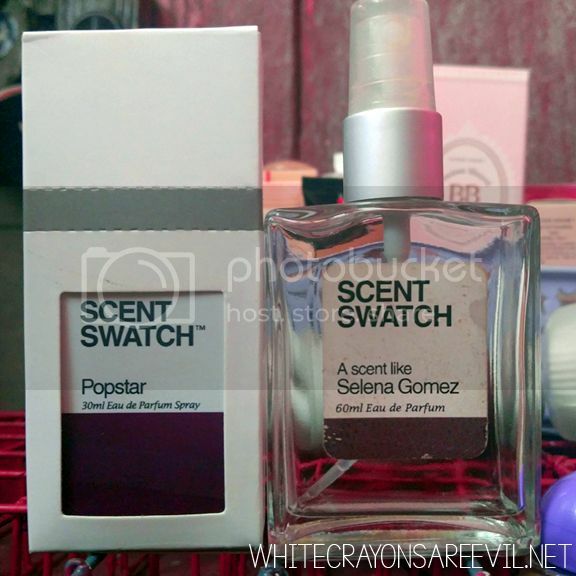 Will I buy again from Scent Swatch? Not only that, I will also recommend them to my friends. Customer response was very fast, delivery was quick, and quality was impressive. But what really is amazing about the perfume is it’s price. I’m just EXCESSIVELY glad that I don’t have to purchase them P2,000-a-bottle perfume. I actually want to hug the owners of SS for giving us cheapskates an option! Hahahaha! Mode of Payments are BPI, and various money transfers like LBC, Western Union, Cebuana Lhuillier, M. Lhuillier, and Palawan Express. 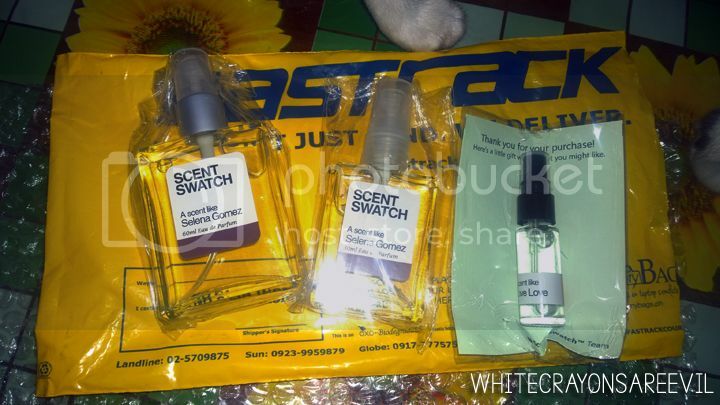 Apparently, Scent Swatch changed their looks. They no longer put “scent like” in their packaging. You can check out a quick guide here if you’re looking for a particular scent. I also bought this one from Shopitude Espana, and swatches are available there. Price’s also higher: P380.00 (60 ml), P200.00 (30 ml) and P120.00 (12 ml). Still cheaper than opting for the Php 2,000-worth of 100ml bottle, so I really don’t mind the slight price increase. They also already have their own website and you can order directly from scentswatch.com. They’re also available all around the metro and some provinces. Check out the branches here. Edit 2: Scent Swatch is now available at BeautyMNL! YEY! It’s a little bit pricier, though and only comes in one size (60ml for P399).